What are the specific requirements for Your free power of attorney form? With a power of attorney you (the Principal) grant another person (an Agent or Attorney-in-Fact) the legal authority or permission to make decisions, as if it were yourself making those decisions. It is up to you to decide how extensive or limited those powers should be! Don't be in a rush! 2. There's no need to issue a General Power of Attorney (with broad powers) if a Limited or Specific Power of Attorney will suffice. 3. Stipulate an expiry date. You can always execute another Power of Attorney form if you still need your Agent to continue acting on your behalf. 4. There is no governing body tasked with policing an appointed agent. It is up to you to review statements and reports regularly. And your finances must be kept in a separate account! 5. 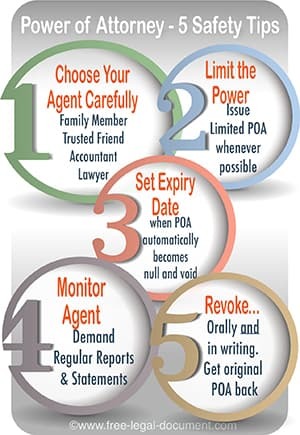 When you wish to revoke the POA, you can inform your agent but you must also do so in writing. Send copies of the revocation to any 3rd party with whom your agent acted on your behalf. Make your selection from our extensive list of free legal templates, but do take a minute and review the definitions and legal guidelines that may assist you in compiling your legal document. Take a look especially at the difference the wording "durable" or "lasting" can make to your General Power of Attorney form (further down on this page). If you have elderly parents, this could become very important should they lose intellectual capacity. Then scroll back up here to select the type of power of attorney form best suited for your requirement. 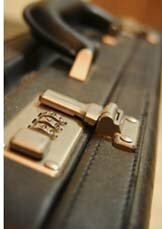 Agent or Attorney - Choosing the best person for the job, duties, fees etc. Special Power of Attorney - Template for vehicle transactions e.g. registration etc. It is advisable to use this type of form, rather than a general power of attorney as far as possible. In most cases you can issue this form to let your Agent take take of specific duties only e.g. You need your accountant to file tax returns on your behalf. This need not be a durable power of attorney and must state an expiration date after which it automatically becomes null and void. Your POA must be notarized to be accepted by Government offices, financial institutions and real estate registry offices. This free power of attorney form grants extensive powers to an Agent and is most often used as part of estate planning. If you made it a durable POA, it can also cater for the circumstance should you become mentally or physically incapable from handling your affairs. The elderly person is declared incompetent by experts and indeed incapable of handling his/her own affairs. The petitioner is an appropriate guardian and is willing and able to handle the responsibilities. Therefor, to avoid possible costly disputes and difficulties for your family, it is advisable for elderly people to have a durable general power of attorney in place. A power of attorney always expires upon your death. Thereafter, the person you appoint in your last will and testament as executor, in effect becomes your Agent and it may well be one and the same person. It also ends if you become incapacitated unless it specifically uses the words "Durable Power of Attorney" or "Enduring" or "Continuing" or in the UK "Lasting Power of Attorney. When Does a Power of Attorney Come into Effect? Normally a power of attorney comes into effect from the date you signed the document. This does not mean that you can not make decisions thereafter - as long as you are legally competent, your Agent must follow your instructions. The alternative is to compile a "Springing Power of Attorney". This means that the document is dormant and "springs" into effect only when you become incapacitated. In this form you can issue instructions for example that your appointed physician or two licensed practitioners pronounce you incompetent or the laws of the land will determine incompetence. You must grant permission for the practitioners to disclose their findings. If you are confident that you understand the legal requirements and that you can trust the person you wish to appoint as agent to act in your best interest, then you do not need a lawyer to write your power of attorney. It is not a complicated document. Having said that, (you knew that was coming) everyone's situation is not the same and if you do not find all the answers to your questions, then you MUST consult with an attorney. Especially if you have a variety of financial or real estate matters to attend to! If you use any of the free power of attorney forms on this site, then you'll only have to cover your printing costs and other incidentals e.g. notarization fees. And if you do need legal advice, you can cut down on consultation time - and save money - by going through the information here and making a list of all the issues you need to address prior to your appointment. What are the Responsibilities of Power of Attorney? Most importantly, the Agent has a fiduciary duty to the Principal: To act in a position of trust, with utmost loyalty and to the benefit of the Principal. The Agent is not to act in his own best interests or to profit from this position unless the Principal consents to such a profit. An Agent appointed in a Power of Attorney is not allowed to change your will or make a will on your behalf! And he/she can not make medical decisions on your behalf unless authorized to do so in a separate medical power of attorney. The Agent must never invest in, for example gold shares. As long as you consider the repercussions, nobody can dictate to you what you have to include or exclude (provided you are not breaking the law in any way). This document empowers your Agent to make decisions on your behalf as far as your personal- and medical care is concerned, when you become incapacitated. For this purpose it must be a durable medical power of attorney. A Living Will specifies which treatments you wish to receive or not receive in a medical crisis. The Agent appointed in your health care power of attorney will make decisions according to your wishes in your living will. You can combine your Living Will and medical power of attorney into one document. If you have a separate Living Will, it is important for your Agent to have a copy of it to know your wishes. People who are not allowed to serve as your health care Agent are: people who are paid by you to provide services such as your doctor, therapist, home attendant, landlord etc. (unless they are also your spouse or life partner or family members). A Medical Power of Attorney is not filed with any government institution. You should give copies to the appointed person and your family members and if applicable, your physicion and health care workers. If you enter a medical or other care facility you should also let them add a copy to your records. We advise against making an irrevocable power of attorney. A durable power of attorney is as effective, but should you change your mind it can be revoked. Have the revocation notarized by a notary public and give copies thereof to your Agent and any third party - bank, deeds office etc. to whom it may concern. Perhaps the most often used POA form is a simple proxy (see our blank proxy form below) where a designated person can attend a particular meeting and vote on your behalf. For example, Home Owner's Associations or Body Corporates have annual general meetings (to approve budgets, elect trustees etc.) and quite often it is not possible for the registered owner or landlord to attend. It serves to expedite matters if there is a quorum in either person or proxy. You could give specific instructions to your Proxy or let him vote as he sees fit. Incidentally, we have often given a proxy to a tenant in good standing because such a person has first-hand knowledge of the ins and outs of that particular housing estate. You could make the proxy for a specific meeting or could specify a time period within which your proxy could act on your behalf for a number of meetings. to be held on ________________ 20____ as well as each postponement or adjournment thereof. Unless otherwise indicated, my Proxy may vote as he/she sees fit. The free power of attorney forms referenced on this page are available for various situations and applications. Determine which one will best suit your requirements and edit it accordingly.